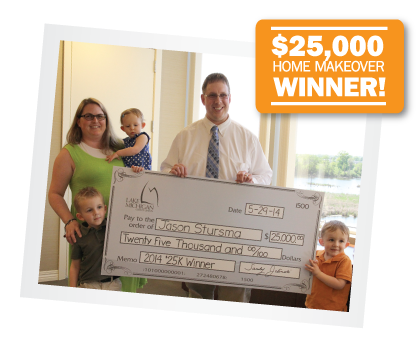 News from LMCU: Jason Stursma wins $25,000 Home Makeover Sweepstakes! Jason Stursma wins $25,000 Home Makeover Sweepstakes! LMCU member Jason Stursma of Hudsonville was ecstatic when he got a call from CEO Sandy Jelinski, informing him that his was the winning entry in our $25,000 Home Makeover Giveaway! Chosen from nearly 100,000 paper and electronic entries, Jason was presented with a check on May 29, accompanied by his wife and three beautiful children. As a young father, Jason works two jobs to make ends meet. “This is awesome! Now we can make some improvements and pay down some debt. What a blessing. Thank you LMCU!” Jason has a mortgage and savings account with LMCU, and plans to deposit that $25,000 into a new Max Checking account.